The site was part of Obama’s larger “Transparency and Open Government” initiative. In a memo issued on his first full day in office, Obama ordered federal agencies to use technology to make the government more transparent, participatory and collaborative. A previous Pew Research Center survey found that the administration’s effort to try to make available many kinds of data collected by federal agencies has been greeted with only modest attention by the public, though a notable share of people hope that data sharing might improve things by improving journalists’ capacities to cover government and make officials more accountable. Independent online petition sites have existed for years. The liberal site Moveon.org began using digital petitions as an organizing technique in 1998. Change.org, perhaps the best-known petitioning site, was founded in 2007 and claims more than 150 million users. 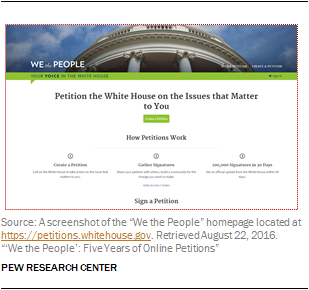 Several other countries (including Australia, Great Britain and Germany) had already established similar electronic petitioning systems by the time “We the People” launched. But this government-created site represented the first time a U.S. administration had established an electronic link between the public and policy makers without any intermediaries. The process for participating has remained relatively unchanged in the five years of the site’s existence. Anyone 13 years of age or older can create a free WhiteHouse.gov account, which allows them to create new petitions and sign existing ones. Users must verify their email addresses but are not required to live in the United States. According to the White House, the site uses extensive monitoring to detect bots. To create a new petition, a user creates a title and provides a description of 800 characters or less. Users can then choose among approximately 20 tags to categorize their petitions. These tags have been determined by the creators of the site and include options such as “human rights,” “firearms” and “criminal justice reform.” Petitioners can choose up to three tags. Once a petition is created, supporters must find their own methods to gain support and encourage signatures. Petitioners often use social media platforms or their existing networks of friends and co-workers. The second time the threshold was raised occurred on Jan. 15, 2013. The new requirement was that petitions had to have 100,000 signatures in order to get an official response. That threshold has remained the same ever since.